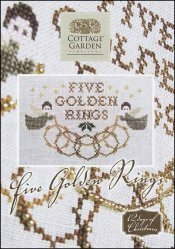 Twelve Days Of Christmas: Five Golden Rings [J8822] - $7.50 : Yarn Tree, Your wholesale source for cross stitch supplies. Part of the 12 Days Of Christmas series by Cottage Garden Samplings. Two angels are holding a garland with five golden colored rings. Stitch count 95 wide x 59 high. Stitched on 32ct Linen.